With clean classical lines and extra large thermal glass windows, the Sheraton stove is ideal for use in traditional or modern settings. Its rear flue exit will fit into a standard British fireplace opening. The traditional stove is available with different grate and thermostat options and a matt black finish. The firebox has a large capacity and uses vermiculite fire bricks; these, together with the advanced aeration system, help produce a clean burn with lower environmental pollution. The aeration system also incorporates an effective airwash system to keep the windows clean. 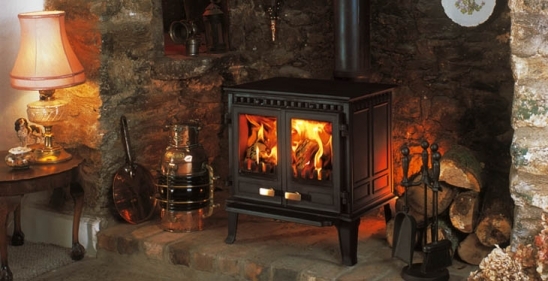 The Sheraton stove is available as a wood burner or as a multi fuel stove. The multi fuel stove is suitable for burning wood, as well as other smokeless fuels. However, the wood burning only version will burn wood with a higher efficiency.